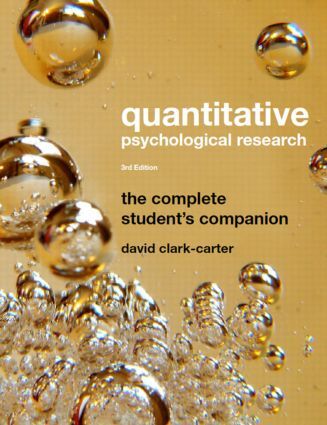 This book expertly guides the reader through all stages involved in undertaking quantitative psychological research, from accessing the relevant literature, through designing and conducting a study, analysing and interpreting data, and finally reporting the research. This third edition includes two new chapters - on preliminary checking of data and allowing for additional variables when comparing the means of different conditions - and expands on original topics such as choosing sample sizes and how to test for mediation effects. It also contains increased coverage of tests and further detail of techniques and terms which psychologists will meet when working with those in the medical professions. As the chapters focus on choosing appropriate statistical tests and how to interpret and report them (rather than the detailed calculations, which appear in appendices), the reader is able to gain an understanding of a test without being interrupted by the need to understand the complex mathematics behind it. In addition, for the first time, the book is accompanied by an online bank of multiple choice questions. Report psychological research in a variety of ways. As such, the book is suitable for psychology students and professionals at all levels, and is particularly useful to those working in Health and Clinical Psychology.